About six months ago a book called Breaking Busy was featured in a weekly Saturday morning email from Propel Women. The bold, white letters of the title shot out at me and I noted the tiny hamster wheel image in the middle of the cover. Small, yet the imagery spoke so clearly to how I had been feeling. I didn't even need to know more, I just needed to find this book and begin reading right away. It came at a time when clearly God was trying to intervene through many different avenues. One, being my quiet drives to work alone, over thinking life, making mental lists for my to-do lists, and questioning my worth. The other in the form of sweaty palms, tunnel vision and shallow breaths, or uncontrollable emotional breakdowns at work and embarrassing weepy runs to the bathroom to wipe the mascara stains. It was in those lengthy drives and in the text of the email from Propel that I finally shut up and listened. It was time to unfriend the word "busy" and relish in the present moments that time so selfishly had been stealing away. Worry had been consuming every moment that my busy brain had wanted to just rest. Things weren't going the way I had written up in my mental journal. So, in order to keep myself from worrying so much, I just said yes to ALL.THE.THINGS and left a vacant seat on the couch where I should have been snuggling with my husband and sweet girls. A quote from Alli that had me raising both hands high in the air - "By recognizing and releasing our fears to God, by letting go of our white-knuckled hold on the details of our lives, and by walking in the belief that He loves us and will provide for us, we find peace and comfort." Yes. YES! Oh man, Amen to that, Alli. I had been seeking these words for a while now. It meant letting go of perfection, letting go of what the 17 year old me had pictured my life would be. It was as if someone gave me the permission to release the expectations I held for myself and my family and hand it over to God to manage. And funny enough, it's what He'd been wanting me to do all along. Alli brilliantly breaks the book down in to chapters that lend support to how we find manageable balance in different areas of our life. Following each chapter, there are a set of Action Steps. I happily scooped up one of my million empty journals and made an effort to participate in this book. And so, this is where I found some clarity. SUGGESTION: Just write about it! Write how you feel, be honest and truthful, don't hold back. After all, it's just YOU you're talkin' to! There is pure, no-judgement therapy in writing and some of the most monumental break through's can come from purging your heart and mind on paper. In the chapter titled Thoughts: Finding Your Peace in a World of Worry, I think I wore out my yellow highlighter. Alli shares about her anxiety and worry after leaving a successful venture she basically birthed to follow what God encouraged her to do. In this chapter, she touches on negative speak, or as she calls it "false scripts", worrying about the future, I'll be happy when....., focusing on our flaws and thinking we aren't good enough. In combination, we basically use our busyness as an escape from facing these progressing, intense feelings. All the things I had been allowing in to my life. Therefore, I was just one break down away from complete and total emotional destruction. 1. Identify a destructive thought pattern that plagues you. Write it down. 2. Find a Scripture that counteracts your destructive thoughts, replacing them with God's truth. Memorize it. 3. Ask yourself if you have ever thought, "I'll be happy when...." Do you believe the lie that you can't really be happy and have peace in your life until some benchmark is reached? 4. Every day think of three things and people you are grateful for. Write them down and if possibly, tell those people you are grateful for them. By actively participating in this book, I made some steps towards restoring my confidence and faith in the life that God had put before me and my family. Gratitude began absorbing some of my grumpiness and fear turned to faith. Instead of seeking additions to my to-do list and filling my calendar to keep from facing reality, I have been seeking comfort in His word, in prayer, and in the counsel of genuine friendships. 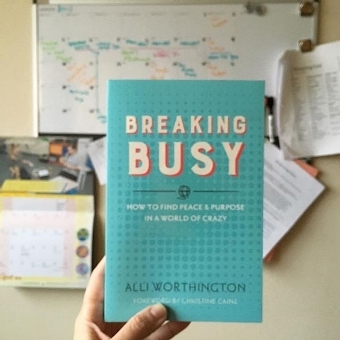 I highly encourage you to give this book a read and see how you can break your habit of busy!